and still can't afford the bells and whistles). I have been keeping reef-type tanks for about five years, and it's no surprise that it's become a bit more than "just a hobby". It's given me the incentive to become SCUBA certified, which has lead to some of the most incredible experiences of my life. It's also allowed me to explore areas of my scholastics in a more practical, every-day way. though, of course, I'll never need it now. 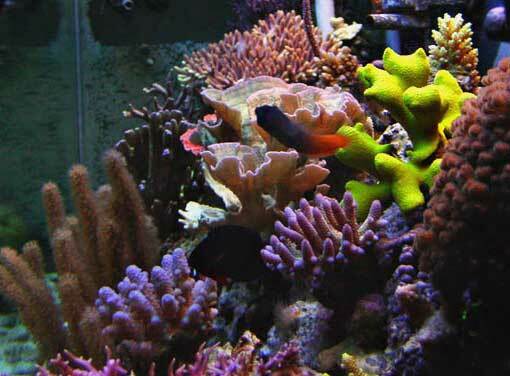 The tank substrate is 4-5" deep and consists of mixed sizes of CaribSea aragonite. 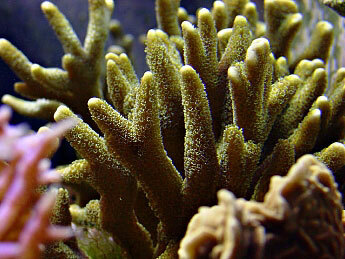 It is approximately 70% sugar-sized, 20% crushed coral, and 10% larger particles. There is about 90 pounds of Fiji and Vanisi live rock, all of which was added uncured. Curing was done in the tank, took about a month, and did not please my fiancée at all (she digs it now, though). After the rock had cured, I added a detritivore kit from IPSF including bristleworms, various mysids, mini brittle stars, spaghetti worms, "peanut" worms, a couple of species of Strombus snails, Astraea snails, and scarlet hermits. This represents the bulk of the sandbed crew, and they have done a bang-up job. 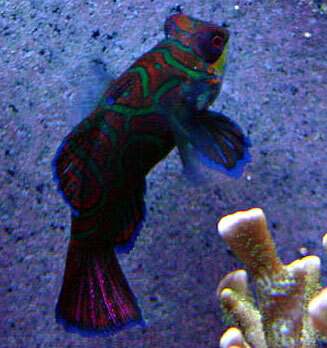 This is the only marine tank I've ever had that hasn't gone through a cyanobacteria/dinoflagellates phase. Unfortunately, the uncured rock also brought along a bit of Bryopsis that has ebbed and flowed throughout the tank's life. Nothing major, though. The sump, as mentioned earlier, is a 30 gallon AGA (36" x 13" x 15") that is separated into three partitions. 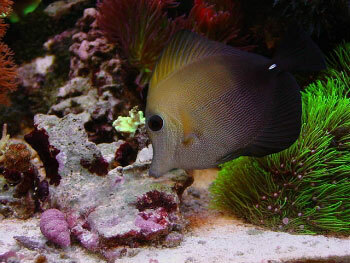 The partitions are quarter inch acrylic that are sealed to the tank's walls with regular aquarium silicone sealant. The first partition receives overflow from the main tank and houses the protein skimmer. It is also a bit of a settle-out zone. The skimmer is an Aqua C EV-150 powered by a Mag 12 pump. Previously, I used a Mag 7, but after some re-start issues, I replaced it with the 12 which I happened to have laying around. Though I have to throttle back the 12 a little, the improvement in skimmate production with the addition of this new pump is amazing. The second partition is about two feet long and has a 4" sugar-sized DSB. 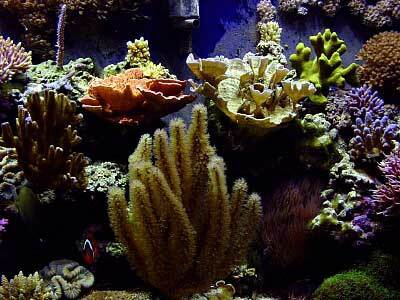 This portion holds a bit of live rock that was removed from the main tank, as well as several species of macroalgae. This partition is lit by a LOA 65 watt fixture and two 15 watt NO tubes. It is on a reverse daylight schedule from 8pm-9am. 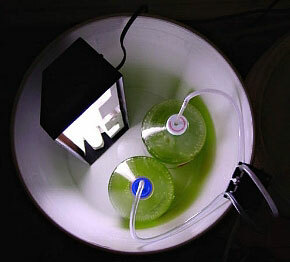 Algae growth is decent, though I only harvest two or three handfuls every month or so. 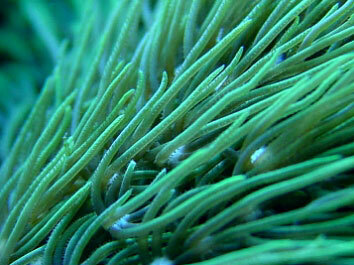 It is mainly a haven for various 'pods and worms - one beauty of a bristleworm, which measures in at over 15"! It's a crowd-pleaser. This section also has a 300 watt and 200 watt Ebo-Jager heater that maintains the temperature between 80-84 degrees on those frigid Minnesota mornings. The third partition of the sump has a vertically-staggered array of acrylic to prevent skimmer bubbles from entering the main tank. This area houses the return pump, a Mag 12. I keep a high-velocity fan in the sump on at all times to facilitate cooling and evaporation (and salt spray). .yet. I also run a 25-watt blue incandescent bulb for "moonlight." The light is on a timer and dimmer so I can try to approximate moon cycles. So far, all it does is look cool. let's just say I wouldn't be tank of the month! In-tank circulation is accomplished by the sump return (~600GPH) and four MaxiJet1200s (~270GPH each) on a Wavemaster Pro. The wavemaker is set on the most turbulent position giving a maximum in-tank circulation of around 1800 GPH. Even after 2+ years, I am still experimenting to find the optimal powerhead placement for the tank. There are a few slack spots where minor nuisance algae growth has been a recurring problem (that darn Bryopsis), but periodic work with a turkey baster has helped the cause. 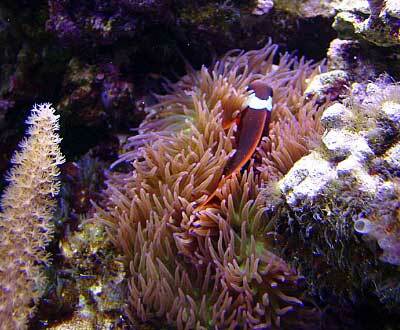 Water changes are done every 6-8 weeks with about 30 gallons of Instant Ocean mixed to a specific gravity of 1.025. I recently made the switch to Crystal Sea salt after Dr. Shimek's report came out. The funny thing is, I previously used Crystal Sea all the time. Once I started talking to more people in the hobby, I joined the herd and switched to Instant Ocean. I've switched back now and am eagerly anticipating the results. I recently purchased a refractometer and was surprised to learn that my cheap five year old plastic hydrometer was only about .002 low. The skimmer cup, column, and prefilter are cleaned at least once per week. The front glass is magnet-cleaned a few times per week and coralline is only scraped from the sides when I am going to take pictures. Other maintenance is done as often as needed (which means it's neglected), but I have become fairly confident in my ability to evaluate the tank's needs by the look and behavior of the inhabitants. 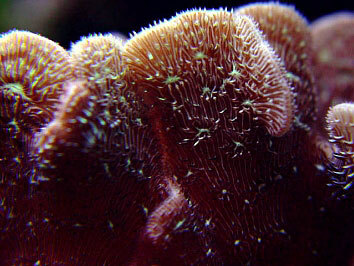 For instance, I rarely test calcium as long as my clams have a clean white ring around the top of their shell. 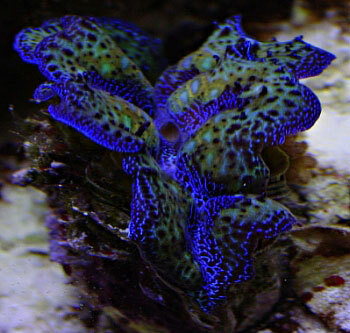 My philosophy is that growth is the first indicator that I am providing the proper environment, reproduction is the ultimate goal, and pretty colors are a bonus! NO2, NO3, PO4: not detectible using Salifert last time I checked (about a year ago). 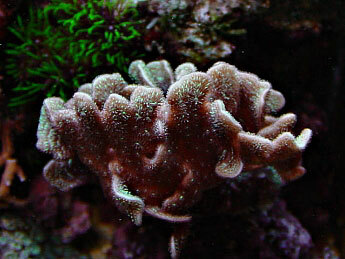 The tank is dominated largely by stony corals. Stocking has progressed slowly and I have become quite skilled at restraining myself with the proverbial reminder that the animals need room to grow. 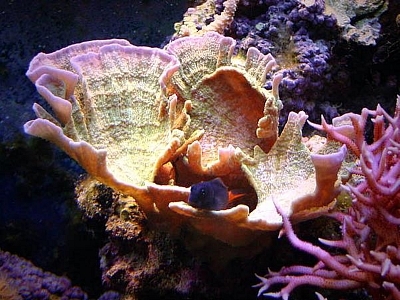 I'm not a big fan of pruning specimens unless I'm fragging, and tend to allow the corals to "figure it out themselves" rather than playing the hand of God. 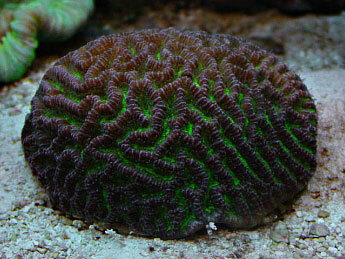 I've had pretty good luck, and there has only been one relatively minor incidence of unexplained coral meltdown. Also, I have been intermittently plagued with the dreaded "red bugs." 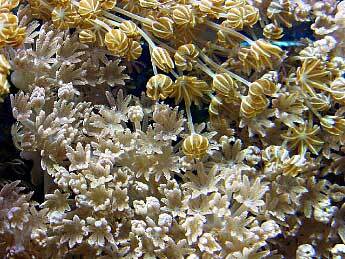 I can't figure them out and I seem to have the nastier variety judging by how the affected corals react, but luckily they ebb and flow. 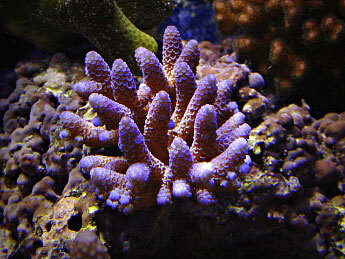 I am not a big believer in hobbyist accuracy of species ID and I hesitate to refer to Acropora and even Montipora by species. The constant shifting and ambiguity of coral taxonomy further discourages me from learning exactly what I have, as if anyone knows! 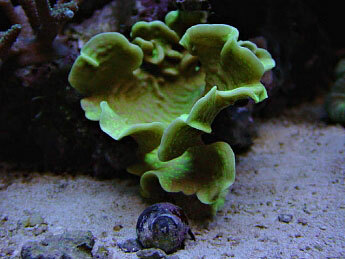 ), macroalgae, Mysis shrimp, golden pearls, supplements, and a few other odds and ends. 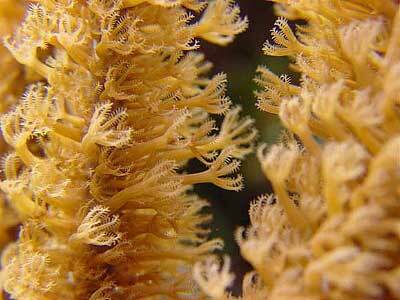 It basically follows Eric Borneman's recipe from Aquarium Corals. I still use some commercial formulas, a couple types of flake food, seaweeds, and the occasional live baby brine as well. As usual, one hobby generally leads to another (for me anyway). 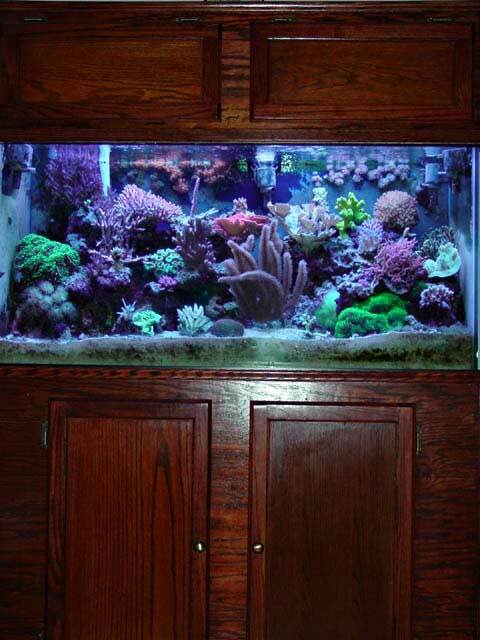 After this tank was up and running, I had to get a digital camera. Well, wouldn't you know Santa came knocking in the form of a Sony Cybershot DSC-S75. It's been a lot of trial and error, but over the past couple years I've managed to become somewhat proficient at getting decent shots. 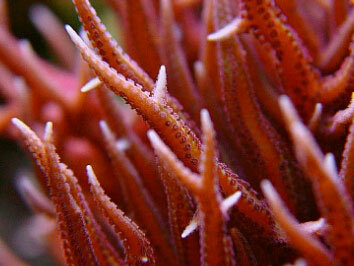 I've found that a tripod is possibly the best photo-related investment I've made, along with a set of macro lenses. Now the problem is the need for more real estate (to photograph, of course). Some pros may find this old hat, but I've found that manually setting the aperture and F-values dramatically increases the color and focus quality. Taking pictures under lower Kelvin halides can really confuse the automatic camera and result in drab colors. I used to be pretty lazy and let the camera do all the work, but with these digital beasts, the sky is pretty much the limit - it's all at your fingertips.